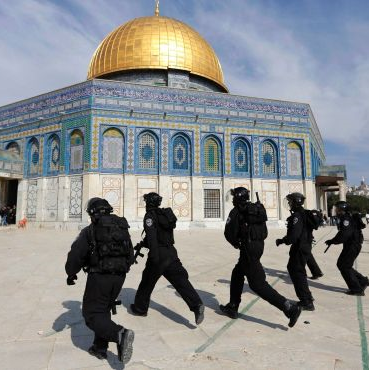 Trembling has seized us as nationalist movements are once again attempting to ascend the Temple Mount, and to campaign for free Jewish entrance to the Temple Mount. Already back in 1967, the members of our Rabbinical Court, of blessed memory, warned in the name of the Torah that it is a severe and grave sin to enter the Temple Mount nowadays, and that whoever enters the Temple grounds is liable to Divine punishment. They repeated this admonition many times over the years, and all great rabbis, both in the Holy Land and abroad, ruled similarly. Now we have come to reiterate this ban, and we declare that the Torah cannot be changed. And to the Palestinian people, as well as all nations and their leaders, we repeat the holy declaration of our former chief rabbi, Rabbi Yosef Chaim Sonnenfeld of blessed memory, published in 1929 in the Arabic newspapers under the title “Truth and Peace”: The Jews do not want, in any way, to take that which isn't theirs. And they certainly don't want to contest the rights of the other inhabitants to the places held by them which they regard with honor and consider holy. And in particular there is no foundation to the rumor that the Jews want to acquire the Temple Mount. On the contrary, from the time that, because of our sins, we were exiled from our land, and our Holy Temple was destroyed, and we have been lacking the purity required by the Torah, it is forbidden for any Jew to set foot upon the grounds of the Temple Mount, until the coming of the righteous moshiach, who with the spirit of the L-rd, which will hover over him, will rule righteously, for the good of all creation, and will return to us the purity required by the Torah. Click here to see the original article by Rabbi Sonnenfeld in the Palestine Bulletin, November 29, 1929. Click here to view the entire Palestine Bulletin for that day.